I am a Muslim and, shock horror, I support Prevent, the government’s counter-terrorist strategy. I do so because I have seen the reality of Islamist extremism in my local community for years, despite the denial by so many other Muslims. When I was at university, I remember meeting Muslim women who were calling for the establishment of a caliphate while ranting on about how evil Britain is. The attack in Manchester was devastating. But last week as I shed tears for the victims, my anger was growing, in particular against what is widely referred to as the Muslim anti-Prevent lobby, who have campaigned against Prevent but now coming out offering us their condolences. It’s high time we examined some of those groups — ask yourself whether such groups have hindered or helped in reducing the threat of terrorism in our country. On Tuesday morning, the Muslim Council of Britain released a statement offering their condolences. We’ve been here before. Statements of condolences and condemnations are always welcome but not if you have repeatedly attacked Prevent and helped create suspicion amongst Muslims about the strategy, including crazy claims that Prevent is driving Muslims towards the arms of extremists. They also claim that Prevent is not engaging with Muslims. What the MCB really mean is that the government is not engaging with them. This is not the 1980s anymore where a representative body made up of community leaders can speak on behalf of all three million Muslims. There are hundreds of Muslim organisations in our country who – rather than having you speak on behalf of them – will choose directly to engage with their government. I believe this is all a deflection from the fact that they have done little, if anything, themselves to counter radicalisation in our country. I want to know what they have done to prevent young Muslims from being radicalised. Even Nazir Afzal, the former Chief Prosecutor for the Crown Prosecution Service, has rebuked the MCB for having done nothing. MCB: Hindered or helped in reducing the threat of terrorism in our country? This is from an organisation which campaigns for both convicted and suspected jihadis and, arguably, has repeatedly been an apologist for terror. 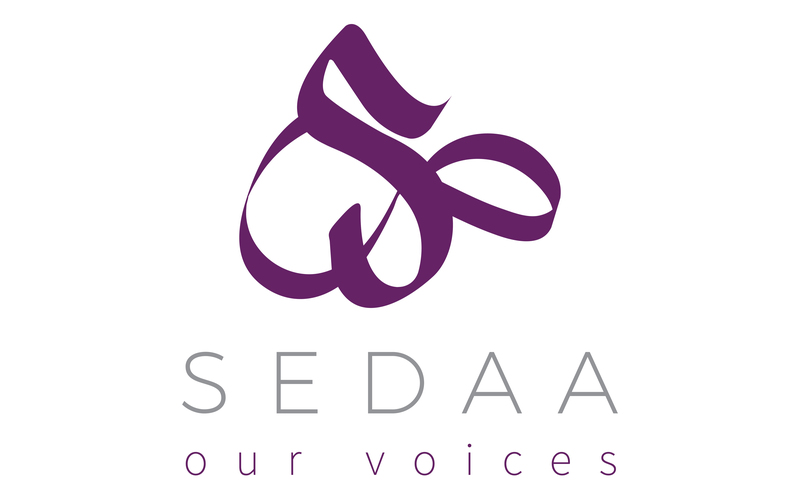 Not long ago, Sedaa posted an expose on CAGE and their vilification of Muslim countering extremism groups. None of that, however, has ever stopped them from providing us with their answer on to how to stop terrorism, which, according to CAGE “logic” is to do away with counter-terrorism measures. Disband Prevent in its entirety. CAGE: Hindered or helped in reducing the threat of terrorism in our country? MEND’s CEO Shazad Amin tweeted that his thoughts and prayers were with all those who have lost loved one. They even set up a fundraising page to raise funds for the families of the victims. How could anyone object? But here lies what I believe is the hypocritical stance of this organisation. MEND have been one of those Muslim groups at the forefront of campaigning against Prevent. This is evident from the countless events they’ve organised in Muslim communities and on campuses. The student union at Salford University, where Salman Abedi studied, passed a motion last year to boycott Prevent. The boycott was part of the Students not Suspects campaign, run by the National Union of Students, and supported by CAGE and MEND. MEND have spoken at and supported the Students Not Suspects events. 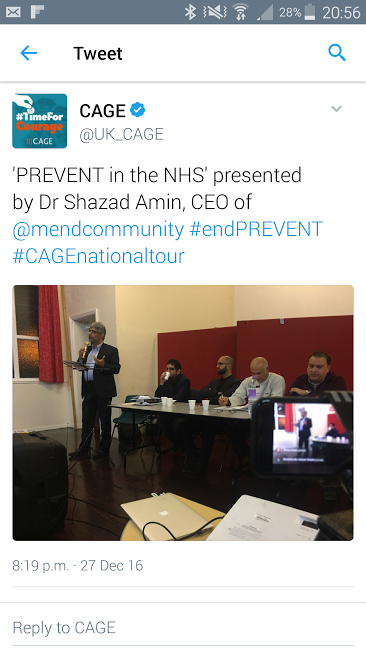 Here is the very same Shazad Amin speaking at CAGE’s national #endPrevent tour. MEND’s Azad Ali, speaking at one CAGE event alongside the notorious Haitham Al Haddad, condemns counter-terrorism laws and bemoans that we Muslims are not praying and praising the mujahideen enough. In true Jekyll and Hyde behaviour, I believe MEND put on a face of respectability – condemning the Manchester terror attack, while having spent years doing everything in their power to undermine counter-terrorism strategies. So spare us your duplicitous crocodile tears about the attack in Manchester. If my friend, daughter, son, or husband had been killed I would throw your condolences back in your face and pathetic attempts to raise money for me. Money will not bring my loved one back. What I would have liked you to do is everything in your power to counter terrorism and reduce the threat. Instead, I believe you have done everything in your power to undermine counter terrorism initiatives and, arguably, increased the threat. How MEND sleep at night is truly beyond me. As a group that claims to campaign against Islamophobia, as a Muslim I see how they increase it; spikes in hate crime against Muslims rise after every terror attack. We’re seeing this now after the attack in Manchester. Are they making any of us safer? That of course hasn’t stopped some of our politicians supporting MEND, including former Tory party chairman Baroness Sayeeda Warsi who, in her book “The Enemy Within”, praises the organisation and Labour politician Naz Shah who has spoken at MEND fundraising events. As has Andy Burnham, the Mayor of Greater Manchester who spoke at a MEND fringe event at the Labour Party conference less than eight months ago, whose were frankly shocking. MEND: Hindered or helped in reducing the threat of terrorism in our country? In an interview with the Mirror, senior nurse Joe O’Brien gave a distressing account of some of the injuries of last Monday’s victims. She said patients were suffering horrific shrapnel injuries to their legs after “metal bolts and nuts, some an inch wide, had gone into them”. There is a reason why we have a counter-terrorism strategy. There is a reason why we need Prevent. There are some Muslims in our country who support ISIS. We must challenge them. But it is high time my fellow Muslims start asking themselves whether some organisations are part of the solution in preventing such horrific attacks from happening in the future, or if they are fundamentally part of the problem. Shamim Begum is a British Muslim woman who, having spent years attending events organised by many Muslim groups, realised how divisive their message was. 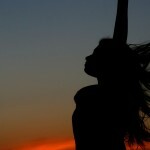 She is now saying no more. “Overall, it appears that Prevent is having the opposite of its intended effect: by dividing, stigmatizing and alienating segments of the population. Prevent could end up promoting extremism, rather than countering it,” the UN report says. So do we think that the United Nations is also shedding crocodile tears as well? Even the anti-Muslim daily express has had to choke on this report this morning. Majid Nawaaz – as usual. Please acknowledge that this guy has absolutely no credibility within UK Muslim circles. Focuses solely on Islam as the cause of the problem will not even utter the words “foreign policy” or “social alienation”. Appalling one sided op-ed piece in the times of Israel in the last 48 hours. Sara Khan – again who does this person actually represent and where did she get her funding from? Has been using her recent publicity to try and bash anybody who speaks out against prevent and was rightly humiliated on question time by an articulate muslim sister who is doing a postgraduate dissertation on prevent who said that the mayor of Manchester knew more about the Muslim community than she did. The Muslim sister who put Sara down clearly said that the Muslims communities ARE looking for good anti-radicalisation strategies but that prevent was not the way forward. The sister also highlighted that the government was giving funds and support to “most favoured organisations” like Sara Khan’s and questioned why this was happening and why nobody else gets a look in. Douglas Murray – basically in a video piece for the Daily Politics show was given a space and a platform to virtually call for the ethnic cleansing of Muslims. So these are the people beating the drum for prevent while simultaneously pointing to our religion as a sole cause of this problem. The reason is very simple because what these people articulate is an argument that says prevent is flawed and that radicalisation has complex and multifactorial causes. 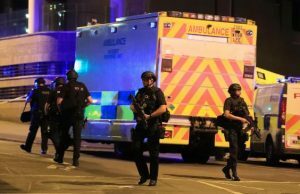 Since this awful terrorist attack we have been presented with some extremely dangerous and toxic arguments – highlighted very clearly in this particular article – which is that it’s either prevent or nothing and if you are against prevent then you are with the terrorists. That is a shameful and unacceptable argument. Remember that this terrorist was reported multiple times to the security services as a potential threat which shows that the community from within does want to take positive action. Everybody wants a strong anti-radicalisation strategy which works with Muslim communities rather than puts them under the cloud of suspicion. I agree with Hifsa Haroon Iqbal prevent lead from the W Midlands who highlights this as a safeguarding issue. As a safeguarding issue it is so so important to get this right. Prevent is a toxic and flawed brand which has lost credibility amongst the Muslim communities – it is time to work with people other than the “usual suspects” like Quilliam and Khan and develop an effective policy and strategy that works for us all. Maajid Nawaz: He may well talk “Islam” but doesn’t as you suggest, rule foreign policy out entirely. If you listen, all of the people you criticise recognise this is multi-faceted to degrees. Douglas Murray: His “Less Islam” comment was calling for “ethnic cleansing”? Have you been listening to Mehdi Hasan? You say the terrorist in Manchester was “reported multiple times to the security services”. At first it was said “the mosque” reported him. Then the mosque said they hadn’t and it might have been someone attending (whoever that is hasn’t shown up). Today, the police say the cannot find any referral to the anti-terror hotline about him at all. 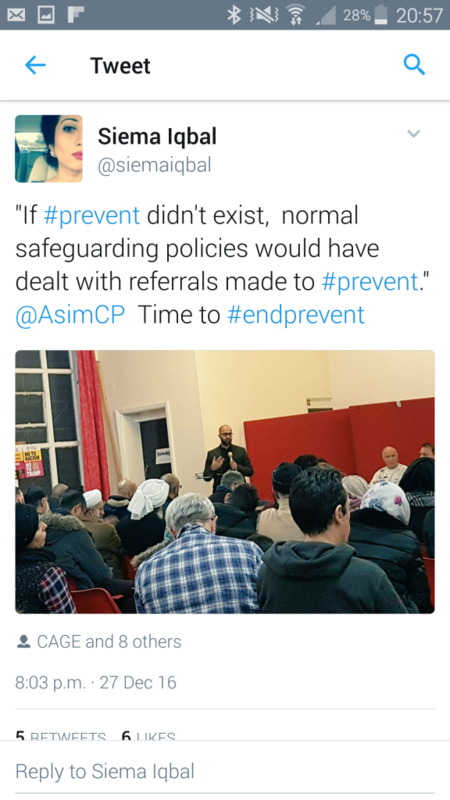 You say “Prevent is toxic” and “has lost credibility”. This sounds like parroting CAGE etc. You ask why Amber Rudd has not contacted the woman you refer to? You ask why Rizwan Sabir has not been on TV? My thing here is that I side with the writer of this article, and certainly not the likes of you.